The springs stimulate the muscles of the user and the movements that are a part of a natural gait are imitated. This way the gait pattern is developed. Furthermore it has been observed that the suspension system very often motivates users with mental disabilities to move around and thus create a platform for further development. As known from the previous Meywalk® models entering and exiting Meywalk® 4 is quite easily done by way of the built-in swing bar that lowers and raises the seat and trunk support when the assisted user enters or exits the walker. The Tool-free adjustments Meywalk® 4 is available in four sizes and can be adjusted to fit the needs and size of each individual user. All settings are done easily without the use of tools, which is a great advantage during active and busy days. Most surfaces on the walker are either coated or upholstered with closed-surface polyurethane that ensures longevity, easy maintenance and cleaning. 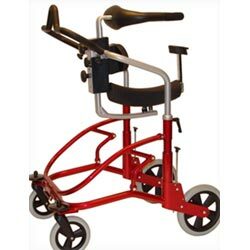 Meywalk® 4 comes standard with dynamic saddle seat and rear stop, handle bar, trunk support in the required size, parking- and drag brakes, non-reverse function, front wheel swivel locks and springs that match the user’s body weight. The trunk support for Meywalk® 4 is available in five sizes.